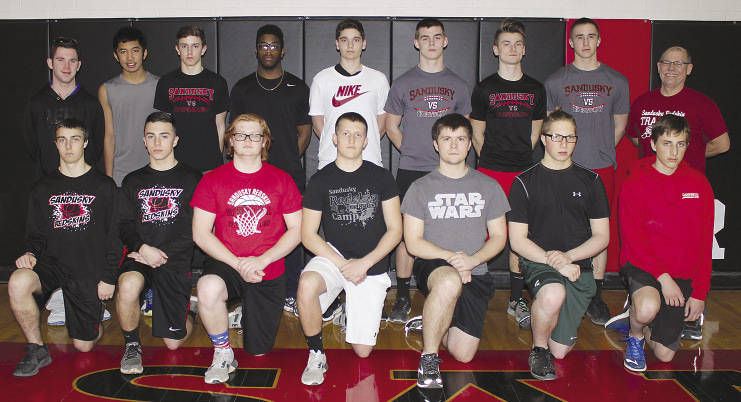 Meet the Sandusky Boys Track Team: Front (l-r): Joe Wentzel, Delorrin Wedge, Jack Sheridan, Tristan Hoff, Josh Paling, Matt Walker, and Kyle Campbell. Back (l-r): Coach Kaden Thompson, Kreigh Dimasuay, Matt Carlson, Mario Brown, Tristan Nosic, Conner Erbe, Bryan Ross, Braxton Washe, and Coach Kurt Wentzel. Missing: Gage Larson, Drew Orchard, Nathan Smith, Josh Bradley.